I will be reviewing this pretty palette from L’Oreal Paris today, which was also a part of their L’Or sunset collection, celebrating completion of golden 100 years of Indian Cinema. This palette is called Eau de Rose which is priced at 770 INR and you may get it for some discount online. 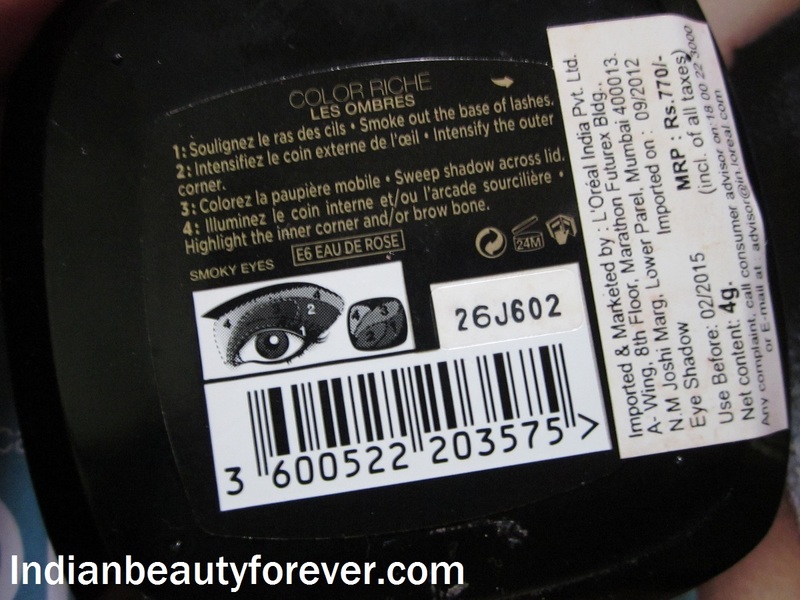 About the product: The L'Oreal Paris Colour Riche Quad Eyeshadow Palette is a small box of eye shadow with 4 shades of similar colours that help create the smoky eye effect. The 4 colours can be used together for heavy makeup, while for light makeup just 2 colours from the quadrant can be used. The colours are deep and rich, in a powder form for even coverage. The 4 colours are chosen well to complement each other for a seamless finish that enhances your eyes and make them look larger and brighter. The quadrant is available in 4 different shades to choose from, based on your skin colour. 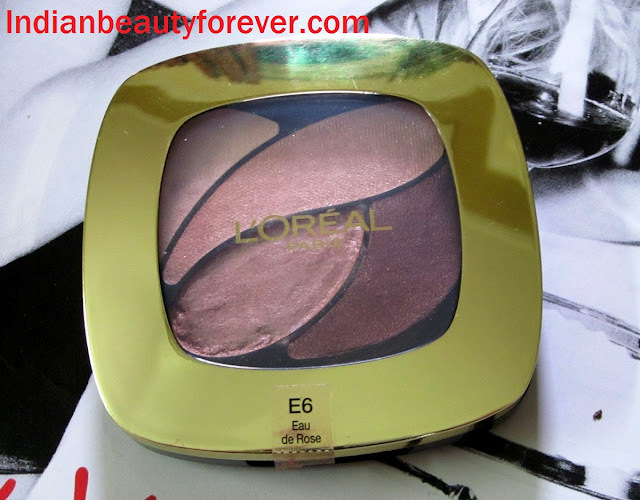 My experience: This L’Oreal Paris palette comes in a square packaging with transparent flip top lid with golden border. Very pretty to look at and light weight to carry. Inside the palette, they have given 4 colors to create a perfect soft smokey look and also a dual end sponge tip applicator with two different shapes. My palette was shattered when it arrived in the mail, that third shade that you see was completely broken and it was all a mess. Boo hoo..:( but I somehow tried to make it sit again in the pan with the help of some isopropyl alcohol and thankfully, it’s fine now! Yaay!! If you will see the colors they have given, a champagne color that can be used as a browbone color, highlighter for lid or inner corner or whatever way you feel like using it. Now, the prettiest and most gorgeous of all is this deep brown color which took my breath away when I swatched it for the first time! It’s a dark brown color with golden and lavender shimmers that are very finely milled, actually that is what makes it more beautiful! 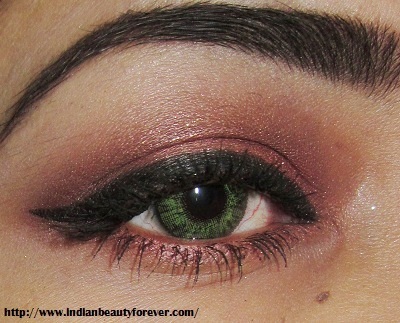 I like such shades as they look beautiful on our Indian skin tones and since it’s a neutral shadow everyone can sport it and just perfect for a soft subtle eye makeup! 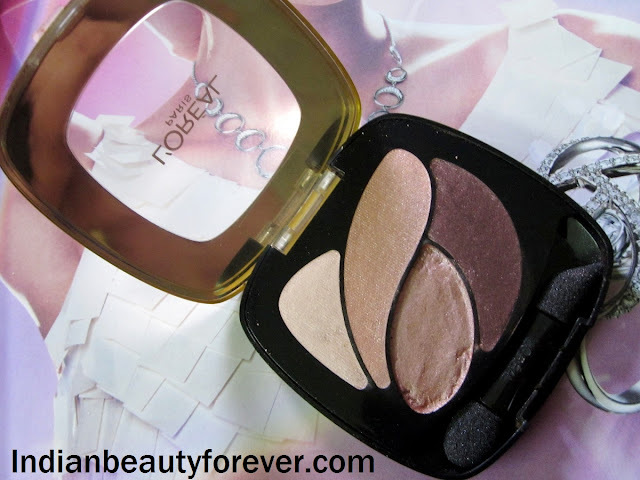 Check out the swatches of this L’Oreal Paris Color Riche Eyeshadow palette below! The brown is very pretty! What say? 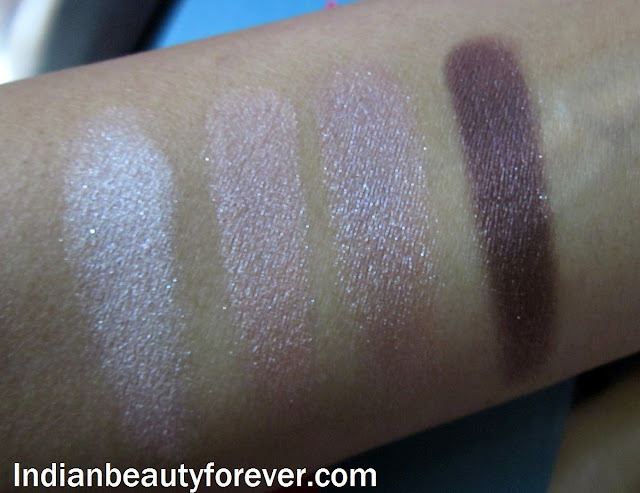 My take: If you really like the colors and don’t mind the price then you may consider it, I loved the brown color the most out of this palette, the other lighter shades can be used for highlighting. Excuse any typos and errors since I wrote it in hurry before the connection expires!! PR sample though you can expect honest reviews as always. aww it is wow on yu.. Very nice review and shades, especially the brown one :) Just sad they are not long lasting without a good primer. The brown one is just fab!! Thanks dear, they perform better with primers. The colors are lovely, I adore rose toned shadows! You wear them so well. Wow pretty eotd Nieshu! All the shades are gorgeous n wearable! Thank you Meghu. :) They are really pretty shades and can be easily carried! Welcome back :) The brown is indeed pretty especially imagining how you have explained it has lavender shimmer though in the eye makeup it seems you have used it sheerly. The colors do compliment each other. Pretty though a little expensive. The glitters could not be captured properly but it's a gorgeous shade. Wish could have been a but cheaper. I'm a huge lover of peach pinks and purple reddish tone browns! I love the eyelook and those shades are so lovely. I recently got a new set of eyeshadows from Coastal Scents and I can't wait to do a bunch of neutral eye looks! I have always been biased towards red based browns. I am loving this palette as well. Plus I an liking the tapered applicator which makes cut crease eye makeup a breeze. I love plums in my crease and with a base, the lighter colors are showing up even better! I too love plums a lot. Brown one is the best shade out of this palette. hi..nice blog...would you like to follow each other?